The Quw’utsun’ – Cowichan People are one of the largest groups of Indigenous People of the Pacific West Coast. For thousands of years the Cowichan People have left evidence of a rich history and culture. For thousands more they have been telling ancient stories of the land and people. This is just one story…. In the time of the Great Flood the People of Cowichan were in great discussion of what to do and how to keep the People safe. The safest place at the time was high on top of Mt. Prevost. Where canoes were anchored with large woven cedar rope. This is when Smuyuqw’a’-Ladybug approaches the leaders and says she can help. The leaders immediately dismiss her and carry on their discussions. Ladybug once again flies around close enough to speak to the leaders. They quickly try to swat her and tell her to go away. Ladybug remains persistent and comes back again. She tells the leaders she can help and please listen to her. She explains to them she can help by drinking all the water! They all laugh and begin to mock the ladybug. So ladybug flies off to where the rising waters are threatening the Cowichan People. This is where her mighty feat begins. Just as she stated the Ladybug begins to drink all the water and it begins to recede. There is a special song that accompanies this story. It is taught to our children so they remember this important story of Cowichan history and teachings. So to this day we are reminded to be respectful to all creatures great and small. The Cowichan Ladybug is a daily reminder of respect and appreciation for life. There are times in life when we need to be brave and challenge ourselves. So the Cowichan Lady bug sits in the middle of her leaves which gives her nourishment of mind and spirit. 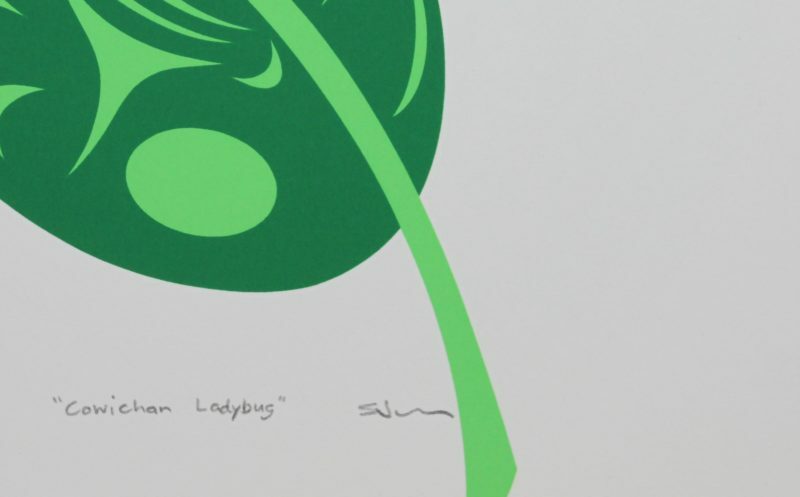 This limited edition silkscreen print titled "Cowichan Ladybug" by Stuart Pagaduan was hand produced by the screen printing process. It is the only limited edition printing of this design. The artist has inspected and signed each copy in the edition. All trial copies of this edition have been destroyed and the printing stencils obliterated. Published by Cedar Hill Long House Art Publishing.